Various efforts to interpret Hurricane Sandy and to consider its political significance prompted me to look back at some early accounts of hurricanes. 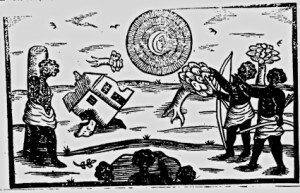 By the early 17th century reports of terrifying storms in the New World that lasted days and devastated large areas started appearing in the Europe. Frequently, these accounts were short, dramatic pamphlets intended to do much more than just report on a new type of storm. By the end of the century, some writers had begun describing storms in Europe as hurricanes, typically to advance some political agenda or some religious ideology (a quick search of the Philosophical Transactions didn’t turn up any articles on hurricanes until well into the 18th century). An early illustration of hurricanes and the New World “Indians” typically affected by them. One of the early reports on hurricanes came from John Taylor, domestic adventurer, poet, propagandist, Royalist, and sometime overseer of the Company of Watermen in London. In 1638 he seems to have published New and Strange News from St. Christophers, of a tempestuous Spirit, which is called by the Indians a Hurry Cano, which happeneth in many of those Islands of America, or the West-Indies, as it did in August last the 5. 1638. Blowing downe houses, tearing up trees by the rootes, and it did puffe men up from the earth, as they had beene Feathers, killing divers men. to build Townes, Cities, and defencible places, to apparell their naked bodies, in their thraldome they found Religion: and whereas in their Freedomes they did use to kill their aged Parents inhumanely, to eate them with savadge, ravenous, most greedy Gormandizing, by Servitude they learned more reverend Duty; they were taught the Rites aud Lawes of Matrimony: And whereas in their licentious freedome, they bedded with their Mothers, Sisters, Daughters, and Neeces, not sparing any Kindred, Aliance, Propinquity, or any degree of blood or consanguinity, they by Servitude learned better life and manners; and also by being conquer’d and overcome, they were taught the use of Armes, the practice of Arts, and the laudable Experience of Tillage and Husbandry. For Taylor, hurricanes served a similar purpose of civilizing “Heathens, Indians, and barbarous Nations unconverted: as for the knowne Examples in America, and in divers Islands adjacent, where this Hurri Cano is frequent.” Hurricanes were God’s mechanism for converting New World inhabitants to Christianity. hey doe observe that just so many daies as it will be before the Hurri Cano doth come, so many Circles will bee as it were fringed and gleaming about the Moone: as if it bee but one day before it come, then there will be but one Circle; if two Circles, then it wil be two daies; and so perhaps three or foure Circles, as it did lately at Saint Christophers, where it came in that fearefull and unresistable fury, on the fifth day of August last, 1638. In the 1670s during the Franco-Dutch conflict, in which England supported the Dutch cause, hurricanes helped explain disasters in the war. More than one pamphlet or broadsheet published in England claimed that hurricanes had ravaged Amsterdam and destroyed reformed churches and buildings in the city. In most cases, the pamphlet claimed to be a translation of a Dutch publication. These pamphlets offer a chance to see how apparently natural phenomena were enlisted in war-time efforts to generate support for the Dutch or attack the French. Natural phenomena are still enlisted in moral, religious, and political agendas, as any search for the terms “hurricane” “sandy” and “god” or as the row between Governor Christie and Mayor Langford reveals. Whether understood as God’s punishments, opportunities to decry bad governance, or a chance to vilify your enemy, hurricanes and other natural disasters are as politically important today as they ever have been.